The Hotel Le Clos Saint Martin welcomes you in Sancerre for a warm and pleasant stay in the Loire Valley. Up on the hill of Sancerre, the Hotel is distinguished by its Napoleon III style from the 19th century, discreet and elegant. Entirely restructured in 2008, the Clos Saint-Martin Hotel has all the moderne comfort, and has conserved the typical charm of the Sancerre region. Choose our hotel for a charming stay in Sancerre. The Saget family knows by exprience what are the charm and happiness of living in a familial country house typical of the Loire. This is what inspired them to create at the Clos Saint Martin the elegant and relaxing atmosphere that sums up well the nobility of Sancerre. Golden lights, warm colours, noble materials… the genuineness of the village and the proximity of the vine give the place the style of the old houses and the pleasure of the oenotouristic exploration in Sancerre. 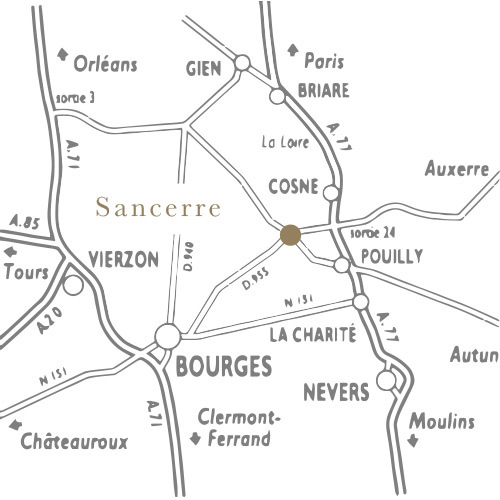 Sancerre is well known for being one of the best white Sauvignon wine in the World. The vineyard is magnificent, both for its position and its tradition. The vines fill the steep hills around the city, and we can admire the splendid landscape of the Loire Valley from Sancerre, which dominates it superbly. Owner of the Hotel Clos Saint Martin since 2008, the Saget family is before all a winemakers family. They have been living in the region for 9 generations. Come and discover our domains and taste or wines in Pouilly Fume and Sancerre while you're staying at the hotel Le Clos Saint Martin. The Hotel Le Clos Saint Martin has 41 rooms of fidderent types : Standard rooms, Junior Suite and Familial Suite. All the rooms have air condition and a large bathroom. Internet is available with wifi in all the hotel. You also have satellite TV in all the rooms. You will be able to discover the city of Sancerre and its fascinating history by staying at the Hotel Le Clos Saint Martin. The story of the city goes back to the middle-age era, and has preserved its legacy, highly visible in its walls.. You could also stop by one of its numerous superb restaurants, as well as wine tasting cellars and art galleries. Around the city, there are many hiking track to discover too, or you could do biking along the Loire, or even play golf a few kilometers away from Sancerre. The Hotel Le Clos Saint Martin is at your disposal to organize your professional seminaries or business trips at the Hotel. We have all the amenities and the equipement required to help you organize your seminaries. You will enjoy the calm and charm of the Hotel, as well as its superb atmosphere and surroundings. You have the possibility to privatize the Hotel Le Clos Saint Martin to organize weddings, baptism, family gatherings or any other feast. The Hotel welcomes you warmly and puts at your disposal all that you could need to celebrate important moments in the best manner.